Reflecting the dynamic relationships between socio-technical behaviour and change, this book presents leading research on the transition process needed to achieve more sustainable transport systems. Focusing on making transition happen, this volume looks at various aspects and factors that are involved in the transition process and their implications for transport policy-making. 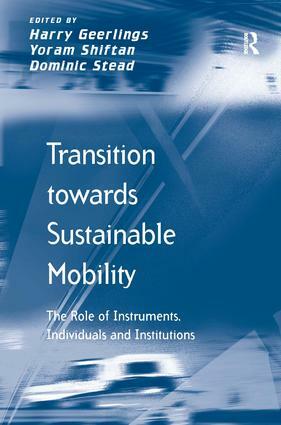 The concept of Transition Management and how it can be applied to the transport sector is considered in detail, and forms the focus of the first part of the volume. The rest of the book is organised according to the three themes of transport energy use and emissions, the role of information in policy-making, and the evaluation of transport policy. This volume brings together scholars involved in research from various disciplines and countries to discuss the relationships between policy instruments, individual behaviour, institutional practices and the transition towards more sustainable transport systems. Dr, Harry Geerlings is Professor in Public Administration at the Erasmus University Rotterdam, the Netherlands, Professor, Dr, Yoram Shiftan is Associate Professor and the Head of the Transportation and Geo-Information Department in the Technion, Haifa Israel. and Professor, Dr, Dominic Stead is Associate Professor at Delft University of Technology, the Netherlands.